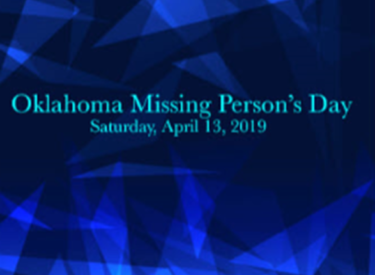 EDMOND — Oklahoma Missing Persons Day will be held on Saturday, April 13, from 10 a.m. to 3 p.m. at the University of Central Oklahoma’s Forensic Science Institute, 701 East Second Street in Edmond, Oklahoma. Families of a missing person and law enforcement agencies are invited to attend this event. Families are asked to bring photographs and medical/dental records of their missing person in order to report them missing, if they have not already done so. Families can also provide their DNA sample at this event. Families will meet Oklahoma Attorney General Mike Hunter, who will speak at 1 p.m. Families will learn about ambiguous loss, the Oklahoma Unsolved Homicides and Missing Persons Playing Cards Initiative, and Francine’s Law. Families will also have the opportunity to network with other families of missing persons.